Canada did it. Kyle Lowry got a late push in the voting from the fans and was named to the Eastern Conference NBA All-Star starters with 646,441 votes. Lowry pulled ahead of the Cavs' Kyrie Irving to take one of the two starting guard spots. Lowry joins Dwyane Wade in the backcourt with Paul George, Carmelo Anthony and Lebron James -- rounding out the rest of the starting five. Teammate DeMar DeRozan congratulated Lowry on Twitter:. 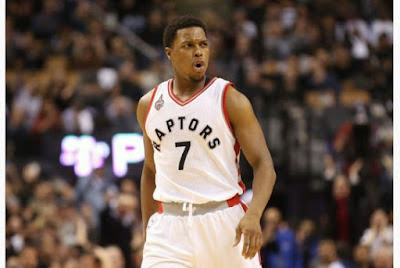 Congrats to my little brother @Klow7. You making me a proud big bro out here man! Kyle Lowry joins Vince Carter and Chris Bosh as the only other Raptors with multiple All-Star appearances. We'll be looking forward to see if DeMar DeRozan will be selected as an Eastern Conference All-Star reserve when they're announced.